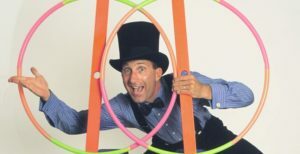 Garry Krinsky combines circus skills, mime, original music, and audience involvement in the exploration of the scientific principles of gravity, leverage, fulcrums, and simple machines. Garry and his audience investigate basic scientific information and delve into the imaginations of scientists who have played important roles in the exploration and discovery of concepts that define our world. Garry brings a number of science-based toys to life with motion, music, humor and insight. A show at The Egg is truly a one-of-a-kind experience, and you may want to add a visit to other Empire State Plaza attractions including the New York State Museum, the Capitol Building, the Corning Tower Observation Deck or the Plaza Art Collection.